Characidae is a large and diverse family of freshwater subtropical and tropical fish, belonging to the order Characiformes. Known as characins, members of this family are found in Central and South America, southern North America, and Africa, and include such varied forms as the piranhas, the tetras, a blind cavefish in Mexico (populations of Astyanax mexicanus found in caves) and Brazil (Stygichthys typhlops), and a species found as far northward as southwestern United States (Astyanax mexicanus) (Nelson 1994). The small size and beautiful colors of many of these fish make them popular aquarium fish, and larger members of the order, such as species of Brycon and even larger piranhas, are important as food resources. Some, such as the "tigerfish" within Hydrocynus (sometimes placed in a separate family, Alestiidae, but sometimes as a subfamily, Alestiinae, of Characidae), are prized as game fish. Characins also are valuable ecologically due to their role in food chains, preying upon smaller fish, as well as insects, amphibians, and crustaceans, and serving as food for larger fish, birds, and mammals. The taxonomy of the Characidae reflects the efforts of people to place the various genera according to relatedness. The difficulty of making this determination reflects the many revisions that this family has experienced in recent years. The Characidae family is placed within the order Characiformes. Characiformes are characterized by well developed teeth (most are carnivores) and the presence of a pelvic fin (with five to twelve rays) and normally an adipose fin, and a body that is almost always scaled (Nelson 1994). The Characidae family is large and diverse, and is one of the only completely freshwater fish families indigenous to both Africa and South America, along with Osteoglossidae (Nelson 1994). The characins are distinguished from other fish by the presence of a small adipose fin between the dorsal fin and caudal fin, although the adipose fin is not always present in every species. Members range in size from just 13 millimeters in length to the large Hydrocynus goliath of the Congo, which reaches a length of 1.4 meters; many members are less than three centimeters in length (Nelson 1994). This family has undergone much taxonomic revision. Among those fishes that remain in the Characidae for the time being are the tetras, comprising quite a number of genera (such as the similar genera Hemigrammus and Hyphessobrycon), as well as a few related forms. These include the cave (Astyanax mexicanus) and neon tetras. The piranhas (Serraslamus) are also currently in this family, although some place them in their own family. Characins inhabit a wide range and a variety of habitats. They originate in the Americas from southwestern Texas and Mexico through Central and South America (Nelson 2006). 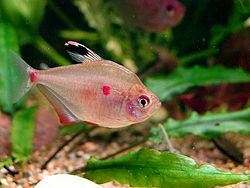 Many fish come from rivers, but the blind cave tetra even inhabits caves. The taxonomy of the Characidae remains unsettled, including some authorities moving many former members of the family into their own related but distinct families. The pencilfishes of the genus Nannostomus are a typical example, having now been moved into the Lebiasinidae. Likewise, assorted predatory characins belonging to Hoplias and Hoplerythrinus have now been moved into the Erythrinidae, and the sabre-toothed fishes of the genus Hydrolycus have been moved into the Cynodontidae. The subfamily Alestiinae was promoted by some to the family level (Alestiidae) and the subfamilies Crenuchinae and Characidiinae were moved to the family Crenuchidae (Nelson 2006). Other fish families that were formerly classified as members of the Characidae, but which were moved into separate families of their own during recent taxonomic revisions (post-1994) include Acestrorhynchidae, Anostomidae, Chilodontidae, Citharinidae, Ctenoluciidae, Curimatidae, Distichodontidae, Gasteropelecidae, Hemiodontidae, Hepsetidae, Parodontidae, and Prochilodontidae. The larger piranhas have historically been placed in the Characidae, but some authorities place them in their own related family, the Serrasalmidae. This reassignment has yet to enjoy universal acceptance, but is gaining in popularity among taxonomists working with these fishes. Given the current state of flux of the Characidae, a number of other changes will doubtless take place, reassigning once-familiar species to other families. Indeed, the entire phylogeny of the Ostariophysans (fishes possessing a Weberian apparatus) has yet to be conclusively settled, and until that phylogeny is settled, the opportunity for yet more upheavals within the taxonomy of the Characoid fishes is considerable. A large number of taxa in this family are incertae sedis ("of uncertain position"). The relationships of many fish in this family are poorly known (Nelson 2006). The genera Hyphessobrycon, Astyanax, Hemigrammus, Moenkhausia, and Bryconamericus include the largest number of currently recognized species among characid fishes that are in need of revision (de Lucena 2003). Among these, Astyanax is the largest genus in the family (Nelson 2006). These genera were originally proposed between 1854 and 1908 and are still more or less defined as by Carl H. Eigenmann in 1917, even though diverse species have been added to each genus since that time. The anatomical diversity within each genus, the fact that each of these generic groups at the present time cannot be well-defined, and the high number of species involved are the major reasons for the lack of phylogenetic analyses dealing with the relationships of the species within these generic "groups" (de Lucena 2003). de Lucena, C. A. S. 2003. New characid fish, Hyphessobrycon scutulatus, from the rio Teles Pires drainage, upper rio Tapajós system (Ostariophysi: Characiformes: Characidae) Neotropical Ichthyology 1(2): 93-96. Retrieved November 21, 2007. Géry, J. 1977. Characoids of the World. Neptune City, NJ: T.F.H. Publications. ISBN 0876664583. Integrated Taxonomic Information System. 2007. Characidae (Taxonomic Serial No. 162848) ITIS. Retrieved November 21, 2007. Nelson, J. S. 1994. Fishes of the World, 3rd edition. New York: John Wiley & Sons. ISBN 0471547131. Nelson, J. S. 2006. Fishes of the World, 4th edition. New York: John Wiley & Sons. ISBN 0471250317. This page was last modified on 4 May 2013, at 14:50.